NEW YORK TIMES BESTSELLER • For readers of Proof of Heaven, the astonishing story of a woman with an extraordinary psychic gift—and a powerful message from the Other Side that can help us to live more beautifully in the here and now. Laura Lynne Jackson is a wife, a mother, a high school English teacher—and a psychic medium. Where most believe an impenetrable wall divides the world between the living and the dead, Jackson sees brilliant cords of light. She has dedicated her life to exploring our connection to the Other Side, conversing with departed loved ones, and helping people come to terms with loss. In The Light Between Us, she writes with clarity and grace, addressing the eternal questions that vex us all: Why are we here? What happens when we die? How do we find our true path in this life? 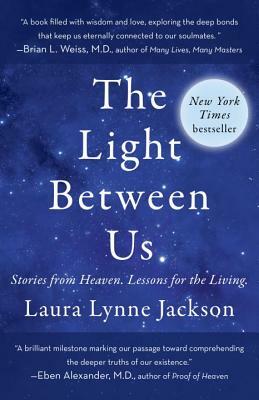 Laura Lynne Jackson’s story offers a new understanding of the vast reach of our consciousness and enlarges our view of the human experience. Laura Lynne Jackson is a high school English teacher and psychic medium who has been certified by the Windbridge Institute for Applied Research in Human Potential and the Forever Family Foundation. She lives on Long Island with her husband and their three children. This is her first book.